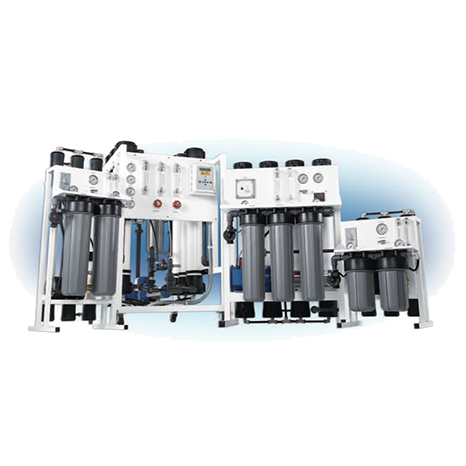 FLEXEON Reverse Osmosis (RO) Systems are designed and manufactured for commercial and light industrial applications. These systems have been engineered for capacities ranging from 500 – 40,000 gallons per day and for municipal and well water supplies. FLEXEON RO Systems come pre-assembled, are fully tested, preserved and sanitized and only require simple utility connections once on site. Systems come ready for immediate on-line service, minimal set up and with little adjustment. The simple, high quality and proven design of FLEXEON RO Systems have made these systems become known as uncomplicated, cost effective and reliable water purification systems. † Please consult individual product specification sheets for more information on available options and upgrades. †† Standard, Advanced and Premeir packages are available for systems up to 20,000 GPD. FLEXEON Reverse Osmosis Systems come standard with a wide range of features. There are numerous options and upgrades available to fit the requirements of a diverse range of water treatment applications. Listed below is a selection of descriptions for our most popular options and upgrades. AXEON HF4 Extra Low Energy Membranes 100 psi nominal operating pressure for increased system efficiency and energy savings while offering a 98.5% salt rejection. AXEON HF5 Ultra Low Energy Membranes The first proprietary ultra low energy membrane in the industry, the HF5 offers superior energy savings with an ultra low operating pressure of 80 psi. AXEON NF3 Nanofiltration Membranes 70 psi nominal operating pressure with a 40 – 50% salt rejection. AXEON NF4 Nanofiltration Membranes 70 psi nominal operating pressure with a 80 – 90% salt rejection. Stainless Steel Membrane Housings 304 Stainless Steel design that withstands various climate conditions and industrial use. Fiberglass Membrane Housings FRP construction which demonstrates higher resistance to varying feed water conditions and chemicals. Concentrate Recycle Allows for increased RO system efficiency by recycling back waste water into the feed stream and increasing the system recovery. Blending Valve Allows for a mixture of feed water into the final reverse osmosis product water to achieve a fine-tuned product TDS. < Dual TDS Controller Allows for simultaneous monitoring of both the feed TDS and product TDS levels, helping to monitor the RO system salt rejection and membrane performance. TDS/Conductivity Meter Allows for the monitoring of the reverse osmosis product water TDS and conductivity levels; useful in evaluating overall system performance. Stainless Steel Booster Pump Offers a longer product lifespan and increased resistance to high TDS feed water and corrosive materials, such as dosing chemicals and antiscalants. S150 Computer Controller Allows for pre-treat lockout functionality, tank level input, TDS monitoring, feed flush, and features a convenient LCD display and alarm function. Minitrol IF Computer Controller Allows for pre-treat lockout functionality, tank level input, and features a convenient LED status display indicator for increased ease of use. Permeate Sample Ports Allows for evaluation of individual membrane performance in an RO system and aids in system troubleshooting and maintenance. Chemical Pump Outlet Provides an integrated power source with the RO system for connection of a chemical feed pump. High Pressure Tank Switch Automatically turns off the RO system at a pre-determined storage tank pressure.